Juliet Stevenson inhabits the title Femme Fatale with such conviction that even a lesser supporting cast would have to rise to the occasion. But the cast here is first-rate as is the insightful and resonant direction by John Tydeman. Not only has he made this intense stage play perfectly intelligible for audio, but he delivers a most engrossing Hedda. The intelligent, spirited, and self-absorbed Hedda has a dull but devoted husband, an ardent ex-lover, and a lecherous old judge hanging around her. Her manipulations, instigated largely to spark her uninspiring existence, result in a tragically untragic shooting and her own virtual enslavement. Ibsen's masterful, flawlessly constructed character study, though written to reflect rural Norway of the 1880s, seems vividly contemporary. Hedda Gabler, the daughter of a deceased General, marries dull George Tesman and foresees a life of middle class tedium stretching ahead when they return from their honeymoon. Increasingly, she is drawn into the clutches of her admirer, Judge Brack, who seeks to establish a ménage à trois. Then the brilliant but dissolute Eilert Lovborg, a former flame, arrives to rival her husband for an academic post. Translated by William Archer and Edmund Gosse. Would you listen to Hedda Gabler again? Why? I bought it for school. But I listened to it a second and third time because it was so entertaining. The sound of the orator's voice, so melodious and animated. I could imagine the scenes by the tone of her . When Hedda is supposedly playing the piano, but is truly about to commit suicide. Yes, I did on the second reading of it. Juliet Stevenson is wondrous in the title role of this Ibsen classic, as is Michael Maloney as her husband. It's truly an outstanding night at the theatre without leaving your living room. The audio quality of this recording is also extremely high ... no hiss or tin to contend with! A great introduction to Ibsen, acted with deft confidence by a wonderful cast. Don't be afraid that this might be just a musty old classic. It is a pleasure from start to finish and perfectly accessible and enjoyable to a modern listener. The performances are exquisite, especially Hedda. Some tiny bumps or glitches in audio, but in no way did it affect my enjoyment. Can't believe how contemporary this play feels--and funny--although it is at times quite dramatic, naturally. Wow. What melodrama. That is just the reason I love it. Today's slippery morals without electricity, automobiles and the Internet. If you love Zola, Wharton or Hardy...please give this a try. The play is acted by many. It's over the top...but I was still engaged and shocked by Hedda. So, I listened to the 3rd Bridget Jones book and Bridget kept talking about remaking this play...having never heard of it before I was intrigued. I had read some of Ibsen's work in high school and found it fascinating, so I figured why not give it a try? I'm glad I did, because I thoroughly enjoyed it even with its tragic ending! 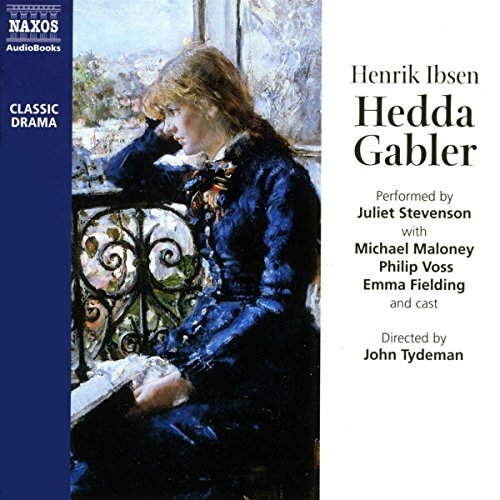 The book Hedda Gabler is listed under Audible Kids. Not really a good book for kids or young teens. You may want to review the book before letting a child or teen go through it. The book has adult content mostly through implied meaning of words and double meaning of words. The book also has a suicide in it. Other then that if you like drama in a story you will more then likely this story. A good little sop opera. Title pretty much sums it up. Fantastic cast, all of the brilliant, Juliet Stevenson is always a wonderful! Little disappointed at how much some of the dialogue is changed in certain places but overall and very good good version, makes me want to see it in live again! Audio plays rely on quality actors. This cast is first rate. A cut above esp with Juliet Stephenson. Be aware of different translations/editions of the original text. Otherwise fine.